Cinco de Mayo is nearly upon us, my healthy hedonists!! I know you’ve likely already lined up your margarita and taco offerings. So I’m going to use my 11th hour holiday PSA to talk about a much overlooked fiesta course: dessert. 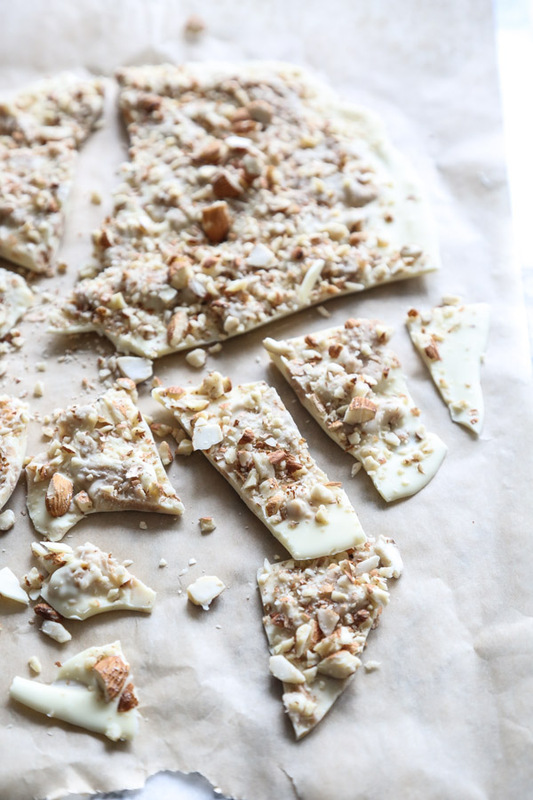 Specifically, this white chocolate bark recipe with lots of horchata pizazz. I don’t doubt that you’ll have successfully fulfilled your daily sugar quota by the end of the first round of cocktails (unless you make my fresh raspberry versions from scratch). And some of you lucky fools may get to experience more via a multi-colored paper donkey that rains Laffy Taffy, Smarties and other candies that no one ever eats unless purchased in bulk. But if, like me, you think a wooden bat and a bottle of tequila doesn’t mean positive things for your decor, I encourage you to funnel that brute strength and boozy adrenaline into something productive, like smashing your very own homemade chocolate bar into pieces. And then throwing those pieces at your mouth. One of my favorite Mexican beverages that doesn’t involve tequila is horchata. I know she’s not Mexican, but doesn’t that word just seem like something Sofia Vergara should be paid to say on loop? Even without the audible enticement, though, horchata is a heathy hedonist’s dream. Before the Yupsters in Venice Beach and Williamsburg started making their own Vitamix nut milks, street vendors south of the border discovered the beauty of selling this cinnamon-vanilla non-dairy beverage in the hot sun (delicious! non-perishable! good for hangovers!). Horchata is made by soaking a combination of rice and almonds overnight, pureeing them, and then straining the frothy mixture through a cheesecloth. I’ve been dying to try my hand at making it from scratch, but since the Vitamix marketing folks have yet to respond to my twenty emails (please, call me!! ), I thought it would be better idea to use the flavor combination for a quick, easy dessert. The technique for chocolate bark is fairly easy peasy, hence why, in addition to frozen veggie burgers, I used to make a lot of it in college. 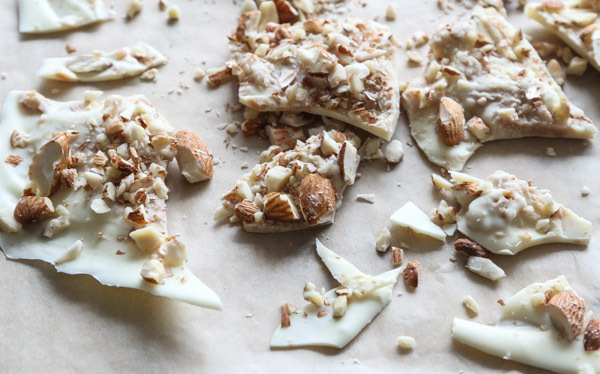 Simply summon that brute strength to break apart a few white chocolate bars (or save your strength and use chips). Nuke the mixture in the microwave in 20 second intervals, stirring after each, until the chocolate is melted. 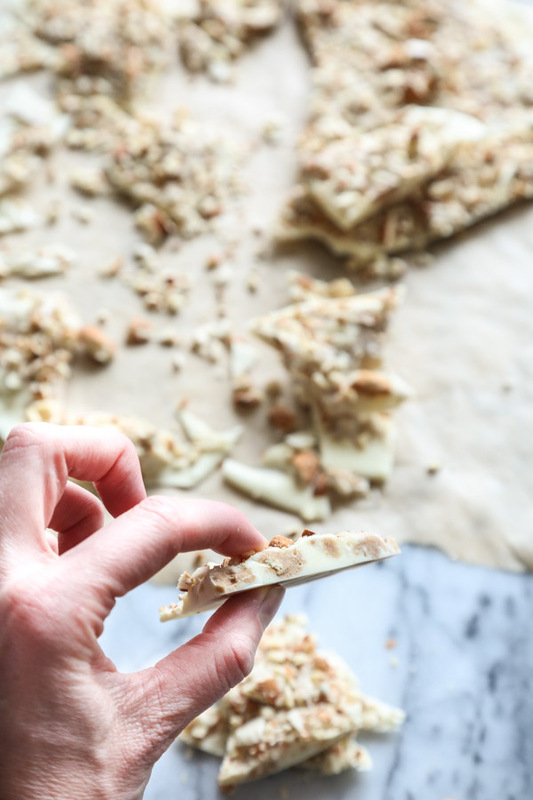 Then quickly spread the majority of it on a parchment-lined baking sheet (I like this brand of Parchment Paper, and here’s a great baking sheet). And this is where things get really festive. 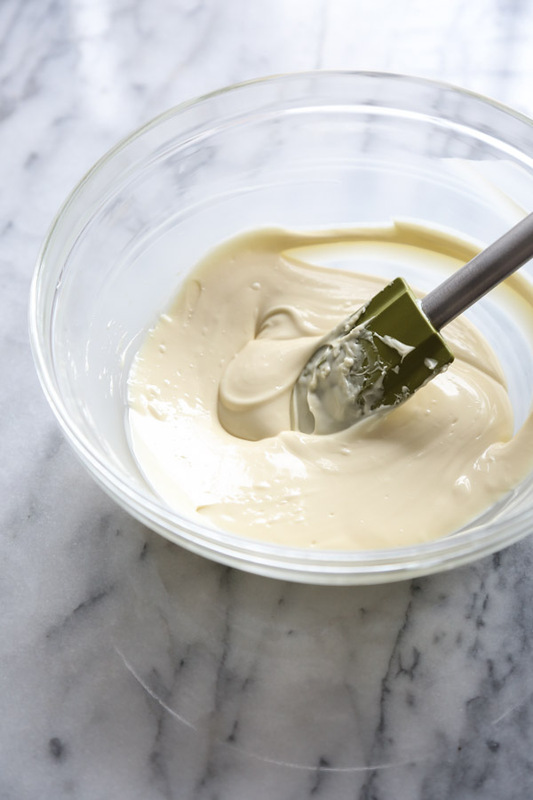 Instead of just sprinkling in some cinnamon and vanilla and calling it a day, I mixed these two elements into a second layer of creamy ALMOND BUTTER. Yes, it’s that exciting. 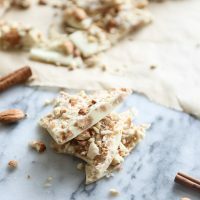 I’ll admit, I had envisioned more of an almond butter drizzle, but the nougat-like mixture that resulted gave the bark some heft, and allows you to bite into a piece of white chocolate and get a surprise hit of creamy, cinnamon-almond butter. Do your best to crumble the mixture into small pieces, as you would, say, cookie dough. And if the result looks ugly, fear not: you’re about to cover up the whole damn thing with crunchy chopped almonds. 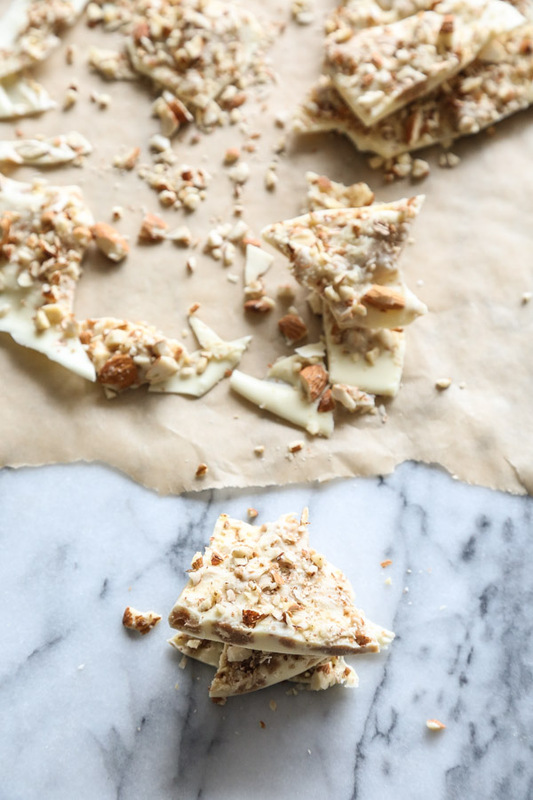 If you’re not having friends over for a fiesta, I highly recommend bringing this horchata white chocolate bark with you to work to share with your coworkers. Having already eaten half of it myself shortly after these pictures were taken, I can say it’s not worth the risk of keeping it close at hand. But if you have superior willpower, the bark will also keep well in the freezer for up to a month. Just pull out a few pieces (or 5) to nibble on after dinners through the end of mayo, or until you run out. For more last minute fiesta feasts, I’ve got you covered here. 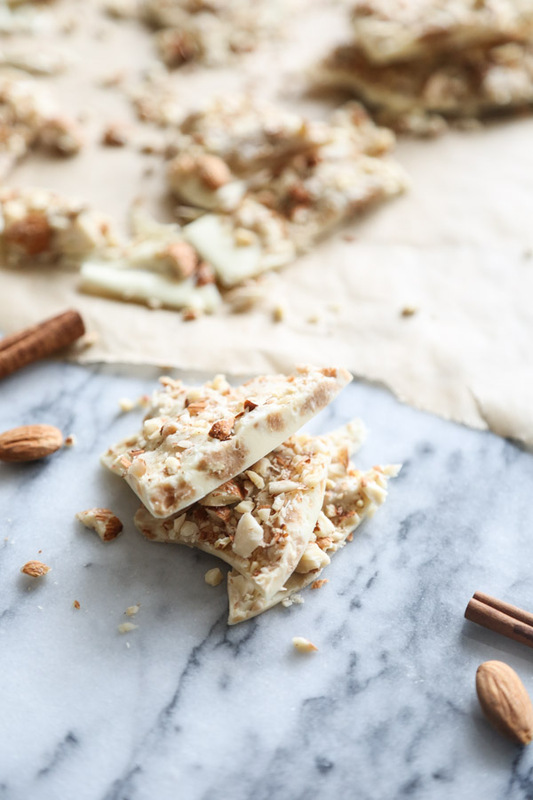 This white chocolate bark recipe combines all the flavors of a classic Mexican Horchata drink. It's layered with almond butter flavored with cinnamon and vanilla. 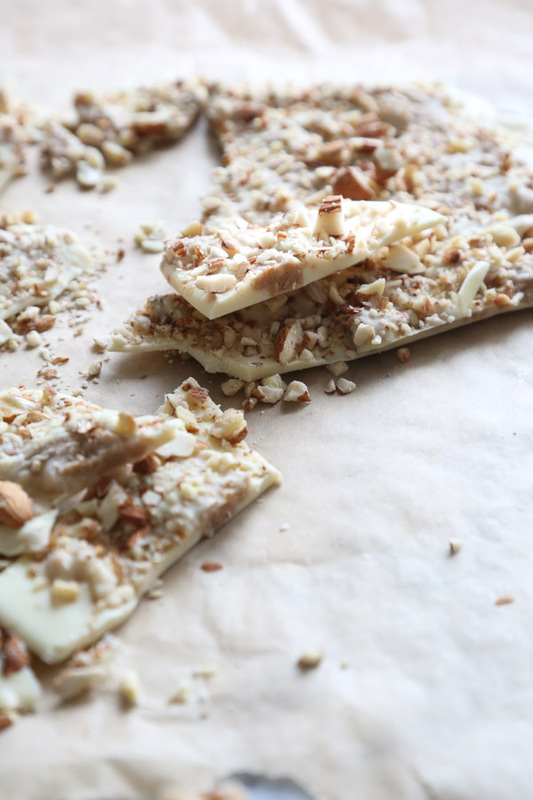 And is topped with even more crunchy almonds. 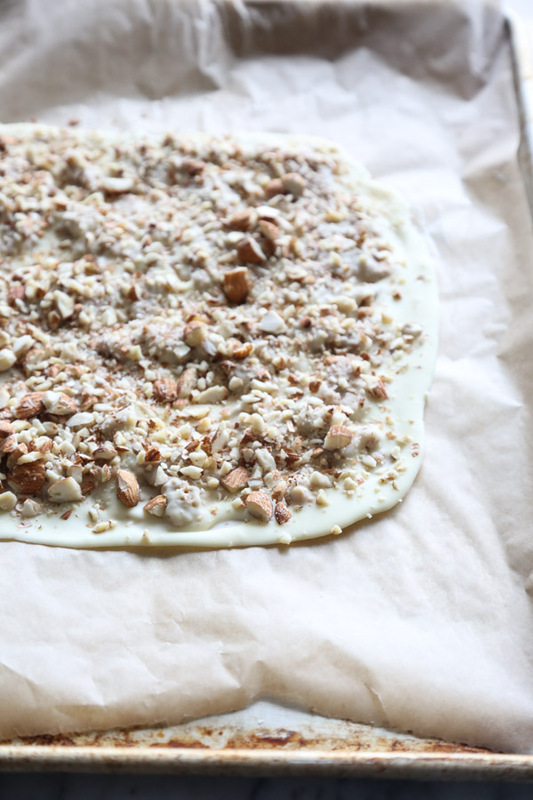 Line a baking sheet with parchment paper and clear a space for it in your fridge or freezer. 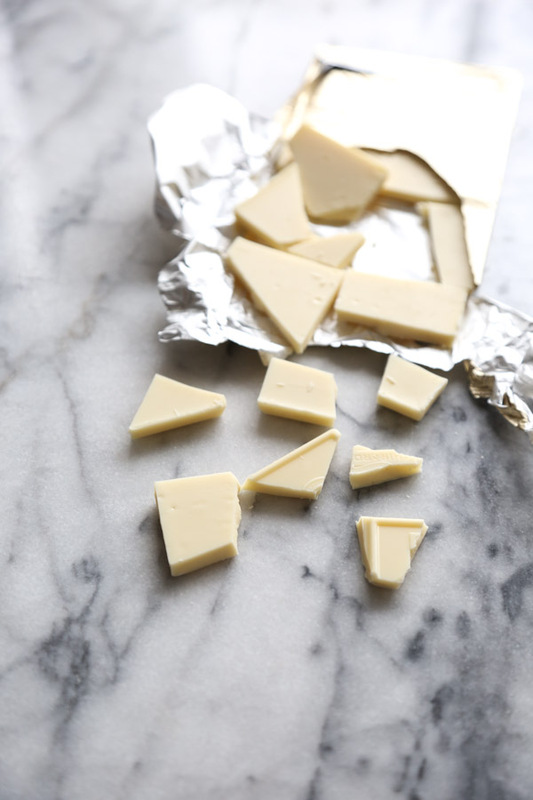 Melt the white chocolate either in a double boiler or in the microwave (use 20 second intervals and stir after each one; about 2 minutes total). 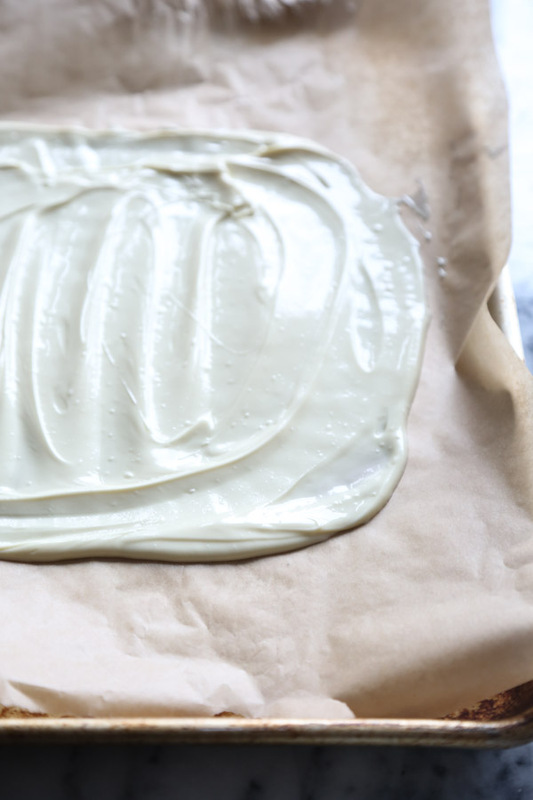 Pour ¾ of the melted chocolate onto the parchment paper and spread with a spatula to form an even rectangle. Quickly, before it has a chance to harden, stir the almond butter, vanilla, and cinnamon into the bowl with the remaining white chocolate. You can nuke for another 20 seconds to get pliable, but the texture will be doughy. 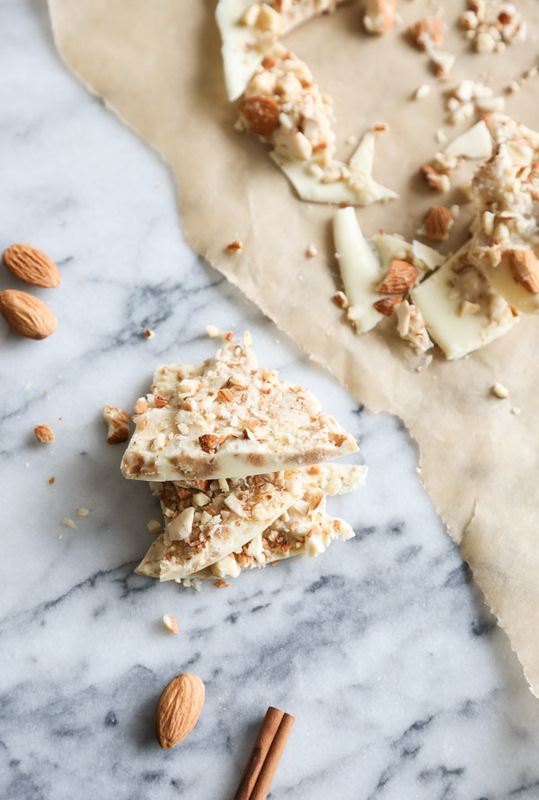 Using your fingers, scatter small chunks of the almond butter mixture on top of the white chocolate rectangle. You can take a spatula to mix and flatten the almond mixture slightly, but don’t stress if it’s a bit chunky. Sprinkle the chopped almonds over the top, along with a pinch of sea salt (see NOTE). Transfer the bark to the fridge or freezer until the chocolate has hardened, about 2 hours for fridge, 20 minutes for freezer. Break into rustic chunks and store in an airtight container in the fridge until ready to eat. If your almonds or almond butter are salted, you can skip the pinch of salt. I wish you could see me drool down my shirt. I’ll have to buy a bib for this. I made this to bring to a super bowl party this past weekend and it was a big hit! I kept some for myself because it was so damn good! And it’s sooooo easy!! I’ll be making it again just for myself!